The congestion charge has cut down the number of vehicles entering central London and earned millions for the city, Transport for London (TfL) said. 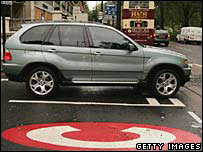 An annual report found that about 70,000 fewer cars a day entered the zone last year due to the £8 toll. It also generated £123m for the city. Traffic has fallen by 15% since the toll was introduced in most of Westminster and Kensington and Chelsea. But critics said the "rosy" picture was misleading as congestion has worsened. The congestion charge zone for central London was introduced in 2002 and it was extended to parts of west London in February. TfL said the congestion on roads was due to the increase in roadworks which reduced the road space. Mayor Ken Livingstone said: "Congestion charging has meant that the number of cars entering the central area has been cut by some 70,000 vehicles a day. "The charge has meant real reductions in traffic emissions, reduced CO2 emissions, and enhanced safety for pedestrians and cyclists, and has also provided vital funds that have been reinvested in the capital's transport network," he added. The charge has also given a boost to cycling, which rose by 43% within the zone. The £123m income will be invested in transport, a big portion of which will go into improving the bus service in the city. Angie Bray, from London Assembly Conservatives, said London roads were "as gridlocked as ever". "Behind the loud self-congratulatory cheers, the picture is not as rosy as TfL would have you believe," she said. "Congestion in the original zone is up by 15% over the last year... in reality it is due to traffic light re-phasing; the installation of bus and cycle routes and other traffic-restricting measures." She also said that 4% of the congestion resulted from the western extension.